just blaze mass appeal netflix rapture series NETFLIX ORIGINAL DOCUMENTARY SERIES - RAPTURE RELEASES JUST BLAZE TRAILER! NETFLIX ORIGINAL DOCUMENTARY SERIES - RAPTURE RELEASES JUST BLAZE TRAILER! From Mass Appeal, Rapture stares directly into the bright light that hip hop culture shines on the world and doesn’t blink. Throughout 8 episodes and featuring a diverse swath of artists -- Nas and Dave East, T.I., Rapsody, Logic, G-Eazy, A Boogie wit da Hoodie, 2 Chainz and Just Blaze – Rapture dives into the artists’ lives with their families and friends, to sitting front row in the studio and grinding on tour, to experiencing the ecstatic power of moving the crowd. All episodes launch globally March 30. 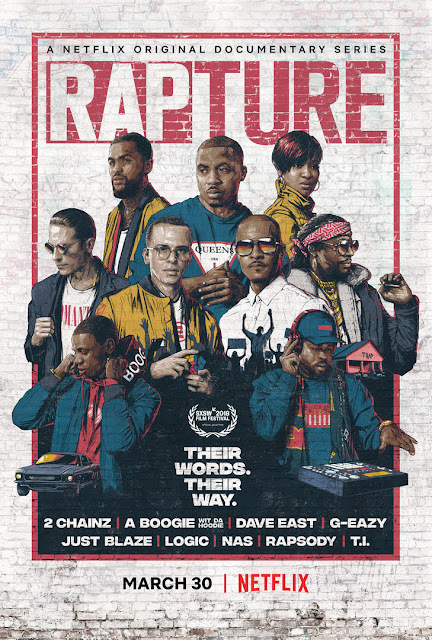 A Boogie Wit Da Hoodie might be the freshest face in the new hip hop docuseries, Rapture, but he is quickly establishing a name for himself with hits like "Drowning". Netflix and Mass Appeal dive into his story to find out how much fight is in this up and commer, and learn why he has the tools to make it to the top.